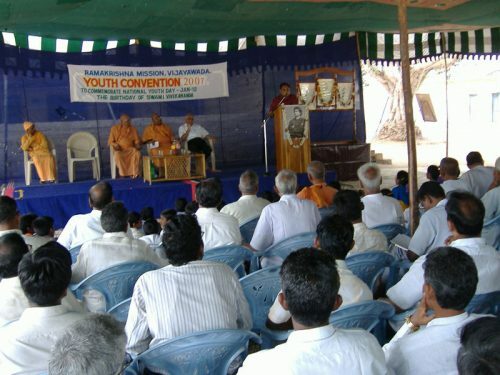 Ramakrishna Mission, Vijayawada added a feather in its cap by inaugurating a programme called “Viveka Vahini” – The Flow of Discrimination, on the National Youth Day i.e., Swami Vivekananda’s 145th birthday on 12th January 2007, in its Ashrama premises at Sitanagaram. 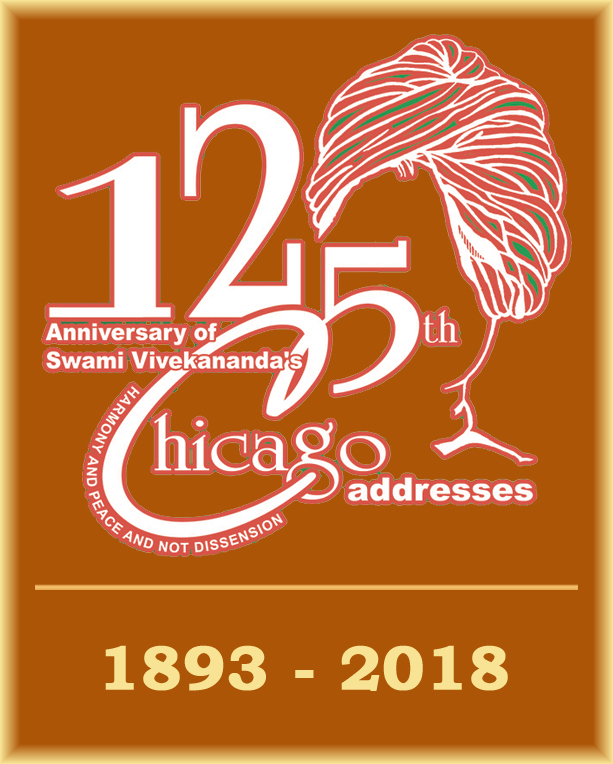 Viveka Vahini is a mobile unit carrying audio – video equipment, pictorial exhibits, a beautiful life-size image, literature on the life and message of Swami Vivekananda. 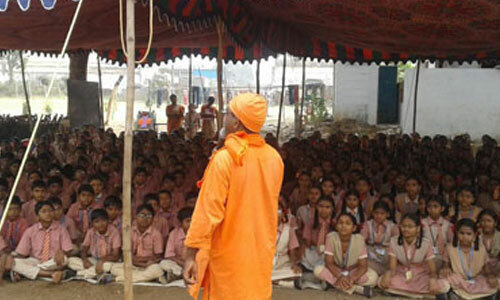 This Unit will go to different educational institutions and rural areas taking the life-giving message of the illustrious Swami to the young students and rural-folk inculcating values in their impressionable minds. The project will also focus on Personality Development, National Integration and other themes of national interest in the light of Swamiji’s teachings. Swami Supriyanandaji while welcoming the gathering explained the objects and utility of the Viveka Vahini project. Srimat Swami Somanandaji Maharaj of Chennai inaugurated the project and while invoking blessings of the Holy Trio expressed that this project will surely benefit the society. Prof. V.Balamohandas, Vice-Chancellor, Acharya Nagarjuna University, speaking as one of the chief guests on the occasion advised the youth to mould their lives based on the life and message of the great son of India. Later, Prof. S.Lakshmana Murthy, Head of the English Department (Rtd. 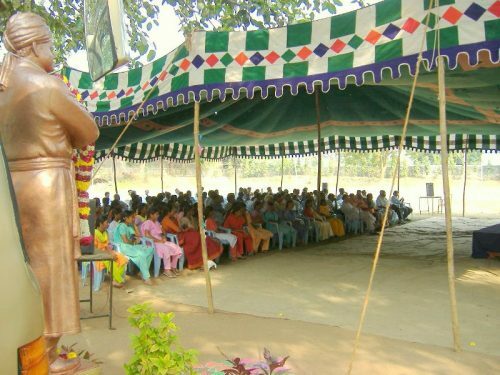 ), Kakatiya University, in his inspiring talk narrated many elevating accounts from the great Swami’s life. He opined that whoever sincerely follows Swamiji will never take a wrong step. A documentary film show on Swami Vivekananda’s life and message preceded the lunch session. In the afternoon session a Youth Meet was held inviting the views of youngsters present on Personality Development and National Integration. While the youth participated enthusiastically Swamis Sashikantanandaji, Supriyanandaji, Ishapremanandaji and Prof. S.Lakshmana Murthy guided the proceedings. This is an outreach program of Ramakrishna Mission, Vijayawada. 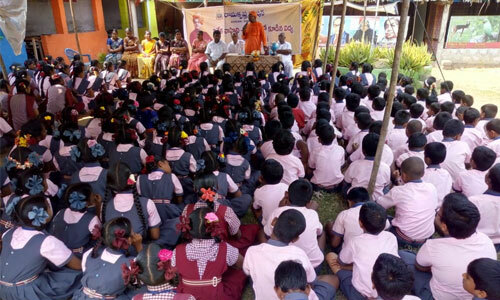 Monks of Ramakrishna Mission travel to remote villages and expose the students of different schools and colleges to the man-making and character building ideas of Swami Vivekananda. To improve the effectiveness of the program further, 70 schools out of the 113 covered this year were selected in four districts and a year-long “Viveka Vahini Values Education Program (VVEP)” was started to achieve sustained effect on student community. A schedule for the students to follow under the supervision of an In-charge teacher was given. Additional inputs were provided to initiate the relevant activities. The Monks are visiting the schools periodically to sustain and reinvigorate the program. The representatives from affiliated Ramakrishna Seva Samithis are also visiting the schools in their locality at least once in a month to oversee the execution of the program and for providing the monthly feedback to us. Based on the feedback, the Monks are in touch with the schools for additional guidance. As part of evaluation and encouragement, periodical competitions are being contemplated along with prize distribution.This year, nearly 35,000 students benefited by this programme and books based on life & teachings of Swami Vivekananda were distributed to them. 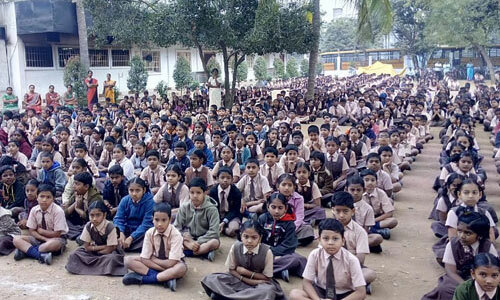 Swami Vivekananda’s laminated photos with his teaching were distributed to all the schools. “If you want to know India, study Vivekananda. In him everything is positive and nothing negative” said Rabindranath Tagore. When Swami Vivekananda was asked in America about his motherland, he said “India I loved before I came away. Now the very dust of India has become holy to me, the very air is now to me holy: it is now the holy land, the place of pilgrimage, the Tirtha!”. India is his queen of adoration. Present day India needs, nay desperately needs, Swamiji’s life-giving message. To this great son of India, in what way can we pay homage? The foremost thing we should do is to spread his message. 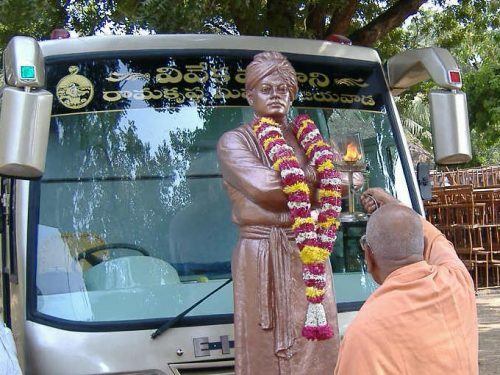 In that direction, Ramakrishna Mission, Vijayawada is running Viveka Vahini – A mobile Value Education Unit – a fully equipped van with audio – video facilities and Ramakrishna – Vivekananda literature. 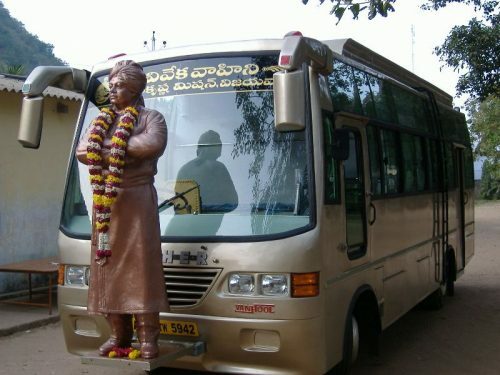 This Viveka Vahini will carry the man-making and character-building message of Swami Vivekananda to the whole of Andhra Pradesh in general and to the coastal districts in particular. The project – Viveka Vahini is estimated to cost Rs.6 lakhs per annum. We earnestly request you to contribute your mite to this noble cause. Your contribution by cash/cheque or D.D. can be made in favour of “Ramakrishna Mission, Vijayawada”. It will be thankfully received and acknowledged with our official receipt. Please note that donations to Ramakrishna Mission are exempt from income tax under section 80G.